with Math4Sale for over 5 years now. 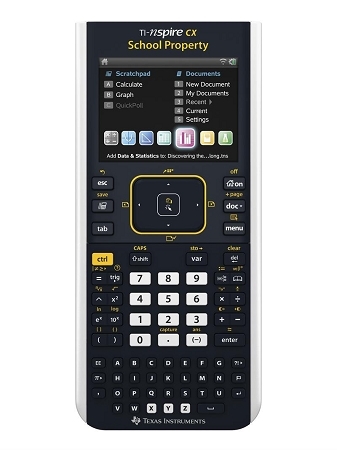 TI-Nspire CX Graphing Calculator 10 Pack - EZ Spot School Property School Bus Yellow - Classroom Set - Refurbished. Units in Like-New, Excellent Condition with New Batteries with 1-Year Warranty. 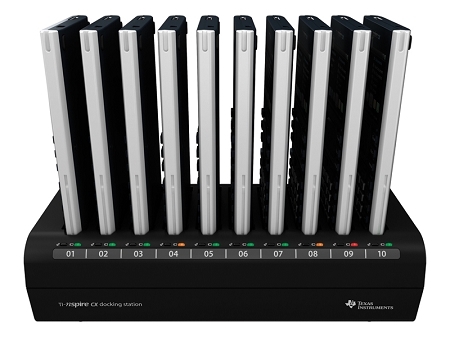 Charging Dock Included for 10 Calculators. Extended 6-months no hassle product exchange warranty. 30-Day Money Back Guarantee. Have a PO? Simply Fax it to 888-325-6940. Math. Science. All on one handheld. curriculum needs from middle school through college. Perform mathematical operations on data and visualize the connections between the data and their plots. Enter notes, steps, instructions and other comments on the screen alongside the math. Summarize and analyze data using different graphical methods such as histograms, box plots, bar and pie charts and more. Create a hypothesis graphically and replay data collection experiments all in a single application. Vernier DataQuest™ is a trademark of Vernier Software & Technology. THese calculators are great. We now have a complete classroom set of 30. THe kids love using them!! Copyright 2012 Math4Sale, Inc.. All Rights Reserved. eCommerce solutions by 3DCart.